If you’re an elementary classroom teacher, most likely you have spelling words to review with your students each week! As a former music teacher at a private school, I would occasionally peek in on the elementary teachers and see them reviewing words by playing games. I think games are a great way for teachers have to make learning fun, so I created these to help with spelling word review. Try out one of these games with your classroom this year! GLOW WORDS GAME For this game, you will need to purchase glow in the dark paint, like Kids Concocotion Gooey Glow. You can get it at Michael’s, or other hobby/crafting stores. The students will need paintbrushes or q-tips, and note cards. Provide little bowls of this product and and have the students mix it with paint. You would then say a name of a spelling word on their review list. The students would the paint the word unto a note card, as they think it’s spelled. Next, if your room is dark enough, you’d turn out the lights and have them hold up their cards. They could then see if it was spelled correctly. If your classroom is fortunate to have lots of natural light, then you would need to create an area in the room that was dark, either by making a little fort (out of blankets or towels) that they could run under in small groups of two or three, or providing a big box (like a refrigerator box) with a door cut out that they could go into to check their word. MUSICAL CHAIRS WITH A TWIST Most teachers are familiar with the classic game Musical Chairs. For this Spelling game, you will want to set up all of the childrens’ chairs in a circle. You will want to have music ready to start and stop for this game, and you will need tape, a note card with a star, and the list of spelling words. The students will sit in the chairs as you are explaining the game. Before each round the students will need to close their eyes. While their eyes are closed, you will tape the star note card to the back or bottom of one chair. Then the class opens their eyes, and once the music starts they will be walking around the inside of the chairs. Once the music stops each child needs to find a chair. Unlike regular musical chairs, where one chair is removed each round, in this game, no chairs are removed. The students look under, or behind, their chairs for the star. Whoever has it will spell a word that you give him/her. Game play continues until all the words have been reviewed. 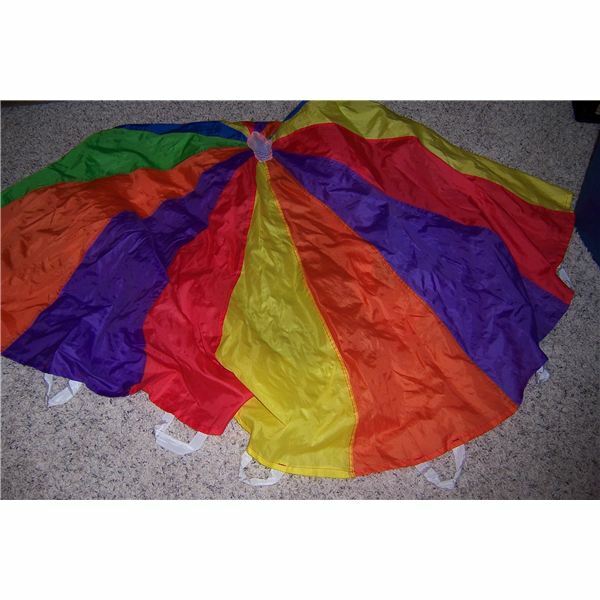 PARACHUTE POP For this game, you will need a parachute, similar to the one pictured. (I bought a parachute a few years ago for under twenty dollars on ebay. It’s gotten lots of use, and it has about twenty hand grips). You will also need about ten small or medium, soft or squishy balls. Each child will get to hold one hand grip, and the parachute will be kept low to the ground. All the balls will be placed on top of the parachute while it is still. Once you say “go” the students will ‘pop’ the balls around on the parachute, trying to keep them on the top. When you say “stop” the parachute and the balls become still, and then you will pick a colored ball to call out, such as “the purple ball.” Whoever is the closest to the ball, takes it, and spells the spelling word. As a variation, you could also call out the color of ball while they are “popping.” The child that catches the ball is the speller. Tip: In order to avoid children fighting over getting the ball, once the color is called, you could make a rule of one turn for spelling per person. SPELLING DETECTIVES This is an easy game that will help students carefully consider the spelling of each word. You will need note cards with each spelling word spelled once correctly and once incorrectly. You will need to hide the cards throughout the room. Explain to the class that the spelling words are all around the room, and that some have the correct spelling and others have the incorrect spelling. Each student needs to only pick up one card (or however many are equivalent to the total amount of cards hiding). Once a student finds a word spelled correctly, he/she needs to find the incorrect match. Once all the pairs are made the game is over. No matter what game you pick to help your class review, they will enjoy going over the word list for the week, with a fun game to help the learning process along.